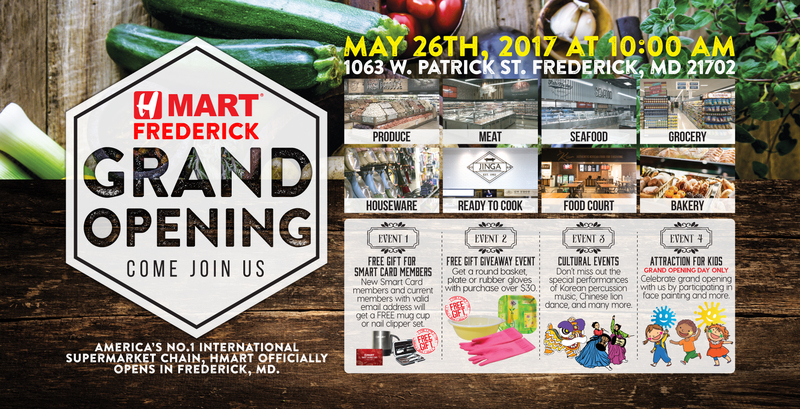 FREDERICK, MD GRAND OPENING MAY 26TH,2017 AT 10:00 A.M. FREE GIFT FOR SMART CARD MEMBERS NOW SMART CARD MEMBERSHIP AND CURRENT MEMBERS WITH VALID EMAIL ADDRESS WILL GET A FREE MUG CUP OR A NAIL CLIPPER SET. FREE GIFT GIVEAWAY EVENT GET A ROUND BASKET, PLATE, OR RUBBER GLOVES WITH PURCHASE OVER $30. ATTRACTION FOR KIDS (Grand Opening Day ONLY) CELEBRATE GRAND OPENING WITH US BY PARTICIPATING IN FACE PAINTING AND MORE. It's been years waiting for this H Mart location. I am so excited to the grand opening!! My husband and i shopped there yesterday. We were overwhelmed with the scope of products and quality. Tonight's dinner was the salmon steak we bought yesterday, Excellent!. We will be back. Thank you for shopping with us! We promise to only get better! Wonderful store in an area which needs rivalitization so very badly. Visited the new store today and it will definitely be a regular stop for us. Everything is fresh and good prices. Make sure you stop & shop. We are Home Away from Home today. As I came inside the store, I could hear the ocean with the sights of the variety of seafood. I could feel like walking in our farm where we grew up, chasing after the chicken and gathering the fresh eggs. I could smell my grandmother's herbal soup and my mother's oxtail stew. I saw neighbors, friends, cousins and coworkers. Thank you HMart, for being part of our community, for bringing more jobs for local families, and above all, your diverse workforce said it all. Your presence has said about the importance of international community. You make us feel like Home Away From Home without leaving the City of Frederick. I have been a loyal customer of the Hmart's in Montgomery County for years!! I relocated to Frederick County one month ago, and I'm ecstatic that I will not have to make a far commute to get the great, fresh seafood and produce that I've been use to. Welcome! Welcome! Welcome! I love the diversity of products in your stores and am so glad you are in Frederick! Congratulations! We have been waiting for this mart. It is really glad to know that you are opening on 26 May. We have been waiting for you for long time . You are warmly welcome to Frderick . As you are located in the center location of Frderick, you will be in our center of Heart . Thanks for coming to Frederick . I am very happy that H Mart will be opening in Frederick. Can't wait for the excellent produce and great prices. Thank you for welcoming us! We hope you always have great time at Hmart!